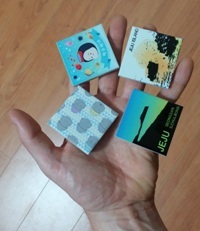 If you’ve ever browsed a stationery store or souvenir shop on Jeju, you’ve likely seen the hand-painted ceramic magnet tiles from a certain design studio, Island, being sold on the shelves. Glazed and painted with haenyo, dolharubang, and other Jeju-themed icons, the magnets have quickly become some of the hottest mementoes for tourists on the island. But the ceramic tiles are only a small part of Island’s larger operation. The stoneware company, founded by Je-hwan Jeong and Woo-a Sim in 2012, recently opened a new art studio along the coastal road of Haeyan-toro with the intention of reconnecting Jeju locals with the island’s storied pottery past. In addition to keepsakes like the tiles, Jeong and Sim regularly produce ceramic cups, mugs, and bowls at the studio, along with some non-ceramic souvenirs, such as map-like puzzles of Jeju and oreum candles. 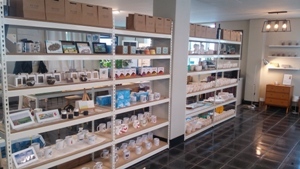 Additional products are released to Jeju retail stores often, but the ceramic products will always be the anchors of the company, Jeong specifies. Jeong’s partner, Woo-a Sim, studied industrial design at Jeju National University before helping to open the boutique pottery studio. 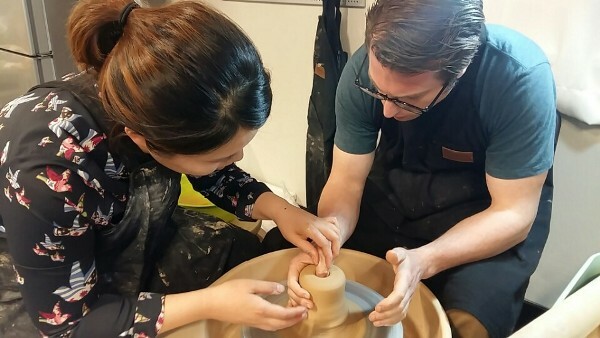 Sim says that Island strives to boost interest in ceramic culture on Jeju now by offering hands-on pottery sessions: For a small fee, customers can visit Island’s studio and take a lesson at a potter’s wheel. In addition to crafting and shaping customized ceramic pieces, customers are able to further personalize their pottery creations with glaze and paints. The idea to offer hands-on pottery sessions came to Jeong and Sim because ceramics have long been a passion for each of them. And, they note, pottery is unique from other art because while molding the clay, the artist is literally customizing a piece of the earth; such closeness can be almost spiritual in how it connects one’s creativity with one’s environment. Indeed, ceramic craftsmanship has a storied past on Jeju. Large earthenware pots called Ongi were historically used to carry liquids around the island. Durable and typically unglazed, recovered Ongi specimens date back to as far as 12,000 years ago. The volcanic soil of Jeju makes Ongi unique from the earthenware in other parts of Korea. Although Island’s contemporary offerings are different in aesthetic and construction than the traditional Ongi pots, Sim feels that the new studio space can contribute to the island’s pottery heritage—by introducing the craft to new generations. “Jeju’s pottery, the most famous being the Ongi, has a long history and many stories,” she says. Island is located in on the second floor at 5-3 Yongma-ro 4, in Jeju City. Anyone interested in crafting a unique bowl or mug can schedule an appointment by calling 064.725.8246. Prices vary, but typically start around 25,000 won. Day-long ceramic classes are also available at the studio for anyone wanting more in-depth instruction. Visit Island’s website, http://www.islandceramic.co.kr, for more information.